I’m so excited, I’m typing a million words a minute right now to tell you that my new natural skincare collection, SIMPLIFY Skin SEASONS: Autumn is live and ready. You can go sign up right now and start making BIG changes. You’re about to kick bad skincare to the curb! Five years ago, I decided that I didn’t want to choose between conventional skincare or blowing our food budget on organic lotions and potions. Making that decision was easy. Figuring out how to do it? That took some time. Back when I first became interested in natural skincare, I was so inspired and eager to make changes! I started binging on Pinterest, collecting recipes and trying them all. A lot of them didn’t work. And far too many of the recipes were overly complicated. Yeah, my bath bomb – bombed! 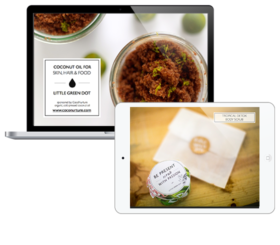 But you know, even with each frustration and disaster – I still loved consuming less and the time spent making more for myself, plus using all-natural products – I adored the results. It also helped that my kids thought I was pretty amazing for making all these fun things. Even if my version didn’t look like a Martha Stewart cupcake! I took that bath bomb cupcake, and created Fizzy Bath Powder – equally amazing for your skin, fun to bathe in, full of exquisite natural ingredients – but without the complicated fuss. And that approach of keeping it simple, has been the secret to my success. I’ve learned a lot over the years about what makes truly good skincare – and it always comes down to this: simple ingredients + consistent routines. And that’s exactly what you’re going to create! When you purchase SIMPLIFY Skin SEASONS – you’ll receive the full recipe guide to make this entire natural skincare range. It’s going to be so simple – but each product is packed with powerful ingredients that heal and restore. You won’t need to buy another piece of skincare – this is all you need this Autumn. You’ll love the recipes. They’re easy to make, easy to use – and create clean and clear skin. It’s such a gratifying feeling to know how to care for yourself – once you make your products, you can make them again and again – with ease. I know what’s it like to start something new. I know how hard it is to take the first step. That’s why in this guide, I’ve thought of everything you need – I’ll show you exactly what you need to get, where to find it, and how to make the products, step-by-step. You’ll get recipe books, and HD video walkthroughs for each recipe, so I’ll be with you the whole time. Plus, you get access to our amazing SIMPLIFY Skin Private Community for more support. Because if you want to go far, go together. I hope you’re excited – join today and get started right away! I want you to be able to walk into your bathroom and see this beautiful range of natural skincare sitting on your counter top, without any of the nasties found in conventional skincare, and made with the purest ingredients that you deserve. When you purchase SIMPLIFY Skin SEASONS, you also get the full three-week SIMPLIFY Skin program – which teaches you how to make skincare for your skin’s exact needs! As a student, you get instant lifetime access to our members-only website. It’s your resource for information, recipes, ingredients swap-outs and measurements. You also have three weeks of lessons to follow, with videos that you can watch anytime, anywhere. You’ll learn step-by-step how to de-clutter your skincare and make daily and weekly skincare routines that are right for your skin. Your body and your wellbeing is the most important thing – you need to take care of yourself, to feel and be your own best. I can’t wait for you to get started and feel the difference simplifying your skincare makes. Sign up today! I’ll send over your details right away!